On Monday, Rob and I drove to the Cape Cod Museum of Art in Dennis, Massachusetts, which is about an hour drive down Cape from Falmouth. We delivered 25 original illustrations from Pocketful of Posies, which will be displayed from now until January 26, 2014. My exhibit is in a gallery space just off of the main room of the museum. It’s an intimate, bright space, painted in a warm golden color, which is perfect for my small pieces. 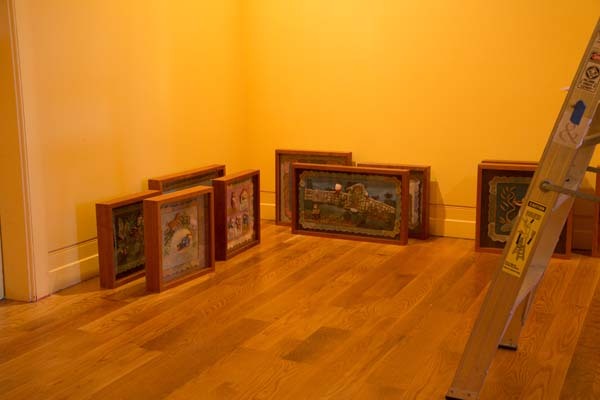 We placed the frames in groups on the floor in front of the walls, to be hung later by the museum staff. I brought some dolls and objects to put in a nice display case in the corner. I wish that Rob had told me to pull down my shirt in back for the photo, but he doesn’t notice those kind of things. 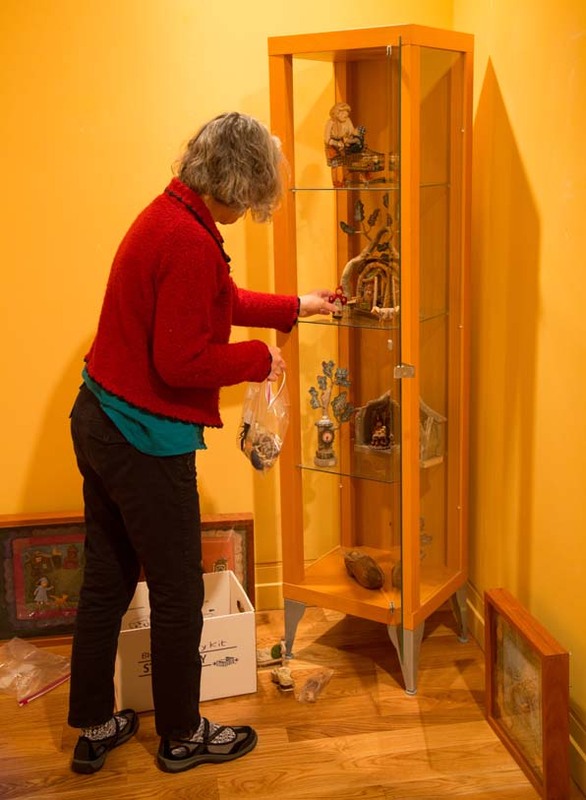 I’m glad to have the opportunity to show some of my sculptural work in the case, which spans from 1979 to the present. Soon, I’ll be heading back to the museum, so that I can speak to the docents and give them some background information about the exhibit. At that time, it’ll be a good opportunity to take more pictures of the show all hung. And then, after the holidays, I’ll return to give an artist talk to the public on Sat., January 4th at 2:00 pm. I hope that some of you live close enough to see the show! 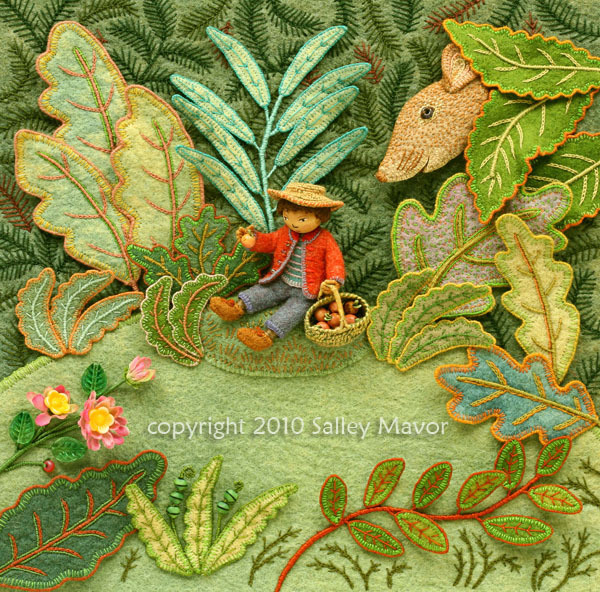 This entry was posted in Children's Books, Dolls, Events, Exhibits, illustration, Posies Traveling Show by Salley Mavor. Bookmark the permalink. Its beautiful what you make,i can see the creative and beautiful human being that you are.As creativity is my first love too,i can understand the love and ambition behind it. Thank you so much for your kind words, Shagufta. I’ve got my husband trained to omit the lower half of my body from any photos that he takes! : ) Hope to get a chance to see your exhibit! Ha, ha, Teresa! Yes, please try to see the show. 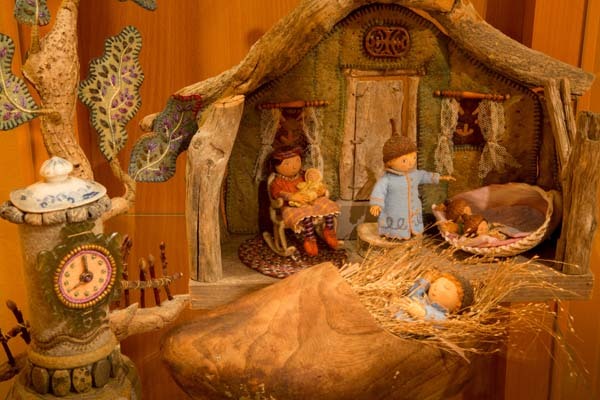 I have loved your work since I saw you making the felt wee dolls on the Carol Duvall show many years ago. I bought your book and made many little dolls for my nieces and for a display in the library. Whenever anyone would comment on my stitches, I would tell them they should see yours. You have been any inspiration. Keep stitching. I remember having to prepare for the Carol Duvall show because my hands would be closeup on the screen. It was was very nerve wracking, making sure that my nails looked good. 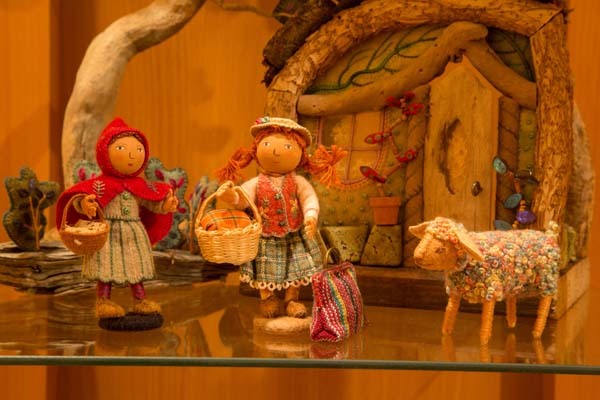 I’m glad that you’ve enjoyed making the dolls all these years and for sure I shall keep stitching! I love your work–especially the close up of that first piece. So green and beautiful with the varied leaves. I’d like to enter that little land. Oh, how I wish I were there! Or at least closer and not so busy with lots of other things! Just love everything about this exhibit, and ALL you do! Beautiful! I took some books out of the library on your “Wee Folk” and am just in awe. I do appreciate your talent and details in your craft. I love the little scene in the last pic! So cozy I want to join them on a cup of tea. They are so sweet, I love the chunky wood that you use, it’s looks so cosy. Wish I could see them!